We are sharing the thoughts of Manny Laureano, the Bloomington Symphony’s Artistic Director and Conductor, with our audience, in advance of our concert “Music in 3D” on Sunday, April 13. We posted previous Manny’s Musings on Strauss’ Death and Transfiguration and Tchaikovsky’s Violin Concerto. Check our website in the coming days for the final installment about Respighi’s Pines of Rome. The beauty of listening to The Swan of Tuonela by Finnish composer Jean Sibelius is in discovering not only what was written but what was left out. The Twin Cities public, of late, has been treated to much of the great symphonic writing by Sibelius as a result of the relationship between their own Minnesota Orchestra and its music director, Osmo Vänskä, also a Finn. As one becomes better acquainted with Sibelius, one becomes familiar with the triumphant sound of brass, the nattering of virtuosic woodwind passages, and sumptuous string writing. One also learns to appreciate the moody brooding of low strings and ever-present timpani rolls. Thus, the omission of trumpets, flutes, and clarinets gives us a color that Sibelius has withheld until this moment from our ears. This specific bit of orchestration allows us to focus on the ethereal nature of a mysterious black swan whose voice is heard in the sound of the English horn. The death of this swan at the hands of a man—for the sake of a woman—holds the key in this portion of a legend called Lemminkainen. If this all sounds rather dramatic in an operatic sense, there is good reason. The Swan of Tuonela is what remains from the overture to an idea for an opera by Sibelius, The Building of the Boat. The opera did not survive despite various attempts by the relatively young Sibelius to improve it. He found that his greatest strength in musical storytelling was, ironically, with notes rather than words. In this he found much more in common with Franz Liszt rather than Richard Wagner, whose music he idolized. 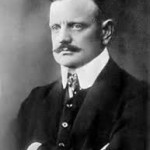 Sibelius’ use of rising strings and the darker-sounding instruments in the orchestra such as bass clarinet, horns, and trombones to support the solo english horn are accented by the quiet flourishes in the harp. All add up to a meditative setting that transcends the earthbound and is transporting.